Have you ever spent the night in a youth hostel? Spending the night in a youth hostel is not first class by any means. However, they are cheap, clean and safe. I have spent many backpack tours throughout Europe and have almost always stayed in youth hostels without incident. Germany has the most youth hostels of any European country, and perhaps more than every other country in the world. Jugendherberge are a primarily German invention from a little more than 100 years ago. In 1909, an elementary school teacher named Richard Schirrmann took his students on an end of year class trip. Richard and his class were caught in a strong thunderstorm and were lucky enough to have been sheltered in a local farmer’s barn. While the class slept out the storm in the barn, Richard came to the idea of the youth hostel: a simple, cheap, safe place for young people to spend the night. Soon, he promoted decent accommodations for hikers, backpackers and travelers in addition to school groups. 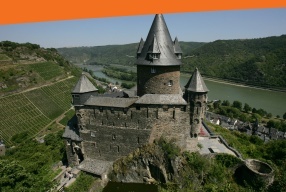 In 1912, the first Jugendherberge opened in a beautiful castle in Altena, Germany. Today, youth hostels are a permanent feature for young people who travel throughout Europe. 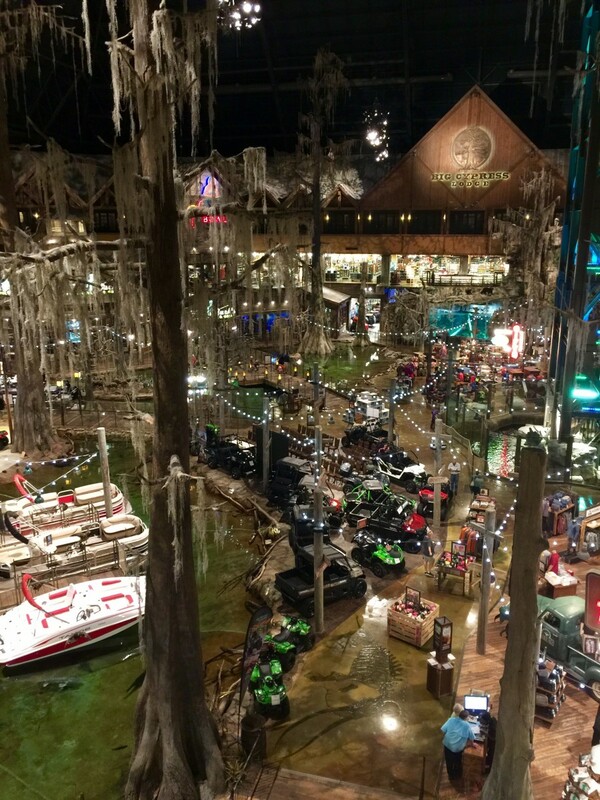 Primarily promoted toward young people, individuals can spend the night with membership up the age of 25. However, many youth hostels still allow adults of any age if the hostel has a vacancy. Moreover, families get special discounted rates and separate rooms. In Germany, youth hostels often solicit families with huge discounts for staying long weekends or days of the week when business is traditionally slower. 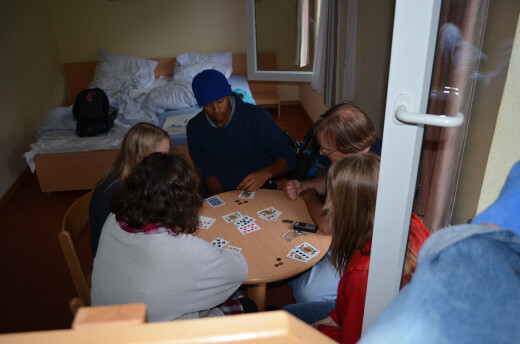 Enjoying a game of cards in a typical hostel room. To be allowed to spend the night in a youth hostel, one need only to become a member of their country’s internationally recognized youth hostel organization. For the United States, membership applications can be found at http://hiusa.org/ . Memberships for religious, nonprofit, recreational, or educational groups are available. 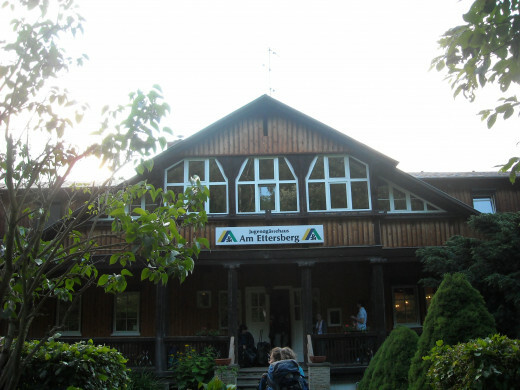 If for some reason you don’t have a membership, the German youth hostels make it so easy for you, you can sign up and join on the spot the first night you stay at a hostel! For other countries, www.hostelworld.com has approximately 27,000 hostels in 180 countries for consideration. 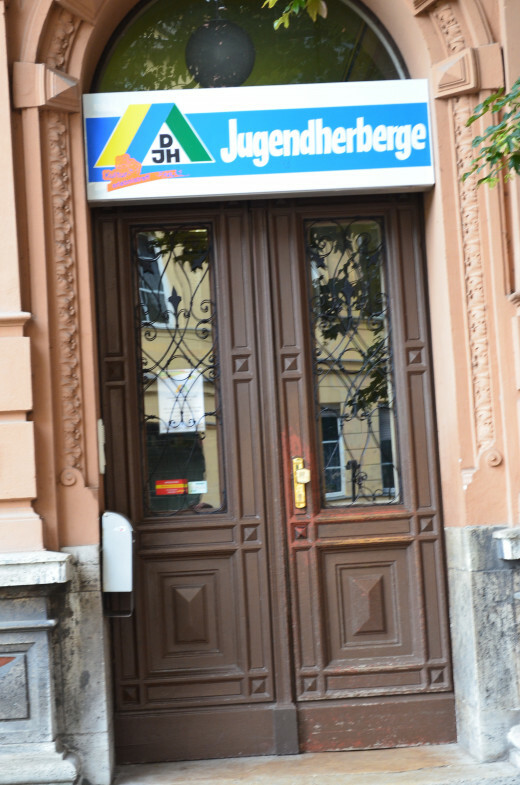 Official websites such as http://www.jugendherberge.de/ allow you to set reservations and surf for any questions one might have. Simply go to the website, click on the British flag for English, and search the page for what accommodations are available. At over 100 youth hostels that I have personally stayed in, someone always spoke English. 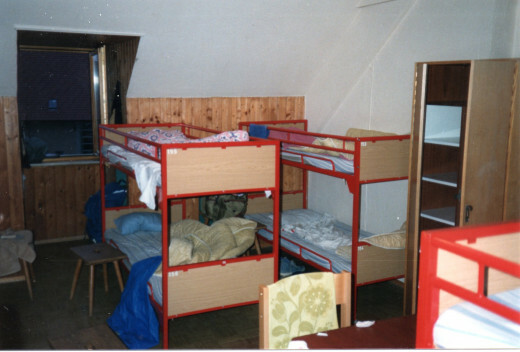 Typical rooms for individual backpackers are shared with other travelers. Each person gets a bed, usually a bunk bed with a locker and key. Every person who shares the room with you gets a key for the room, but each locker is individualized. Although I have spent a night in 1988 in an attic completely alone, in which there were three sets of bunk beds, and the bathrooms were oddly coed, I remind myself that it cost all of 5 Marks, back then about $2.50. However, for adults, groups or families, the rooms are usually larger and many contain their own showers and bathroom. Occasionally I must share showers and the bathrooms with others, but more than often not, as a group leader of high school students I have my own room, shower and bathroom entirely to myself. Most hostels have meeting rooms, dining halls, game rooms and activities available for you use at little to no extra charge. Many of the newer hostels have cafes and bars that are open until midnight. 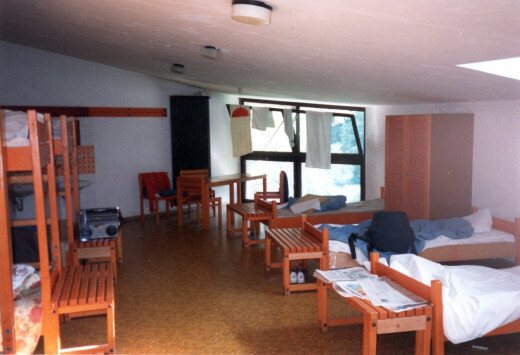 Munich Youth Hostel, Germany, 1988. Youth hostels are everywhere throughout Europe, from capital cities to small villages. 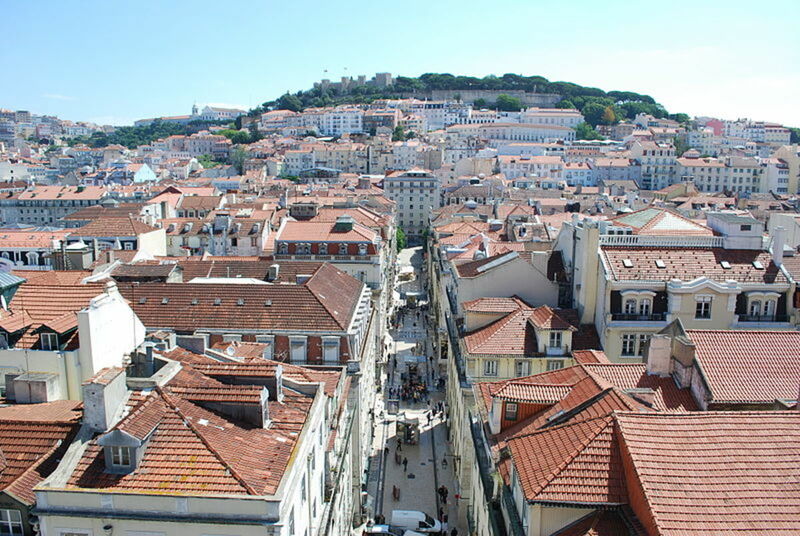 Larger towns have hostels throughout the city, from the touristy areas to the outer limits. Each hostel tries to capitalize on it’s position, either as an isolated respite from the city, or an excellent location to start walking tours of the bustling city. Hostel deep in the woods, near Weimar, Germany. 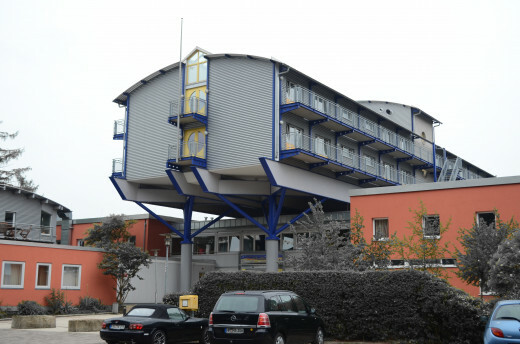 Subsidized from the local governments, youth hostels throughout Europe are generally cheap. However, newer, more modernized hostels can be pricey. Nevertheless, they are generally half the price of a hotel. Price ranges do vary, and location seems to not be the main factor. Indeed, some remote hostels cost more than those in downtown Berlin! 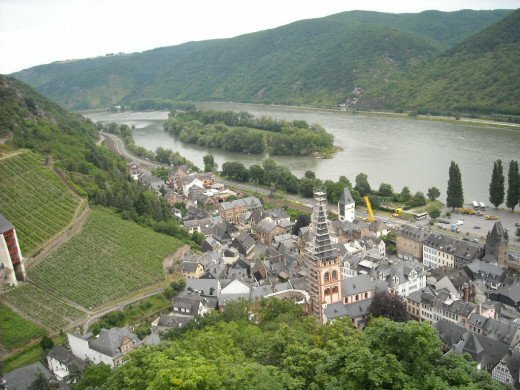 A night in the important industrial metropolis Hannover at the Jugendherberge costs $31.00, while at Bacharach on the Rhine river, in a castle from year 1100 costs $22.00. However, in central Berlin, $26.00 will get you a room, while in London, the cost is $49.00. So, each country and area varies slightly, so do some research. As a group leader, each time I booked nights from the United States, I received a contract from the youth hostel via email. I was able to email them back the signed contract and before I left, I knew exactly how much money was needed for the entire hostel costs. Rhine valley from Bacharach youth hostel. All prices include breakfast. Breakfast at youth hostels varies almost as much as the prices. Some usually just have cold cuts, bread rolls and cereals. Some, however, have fresh fruit, eggs, different hot cereals, a variety of breads, spreads, cheeses and meats. Lunch and dinners are also available, and these are also cheap. I normally eat out and try the local fare. So, don’t be afraid to try out a youth hostel or two on your next vacation to Europe. 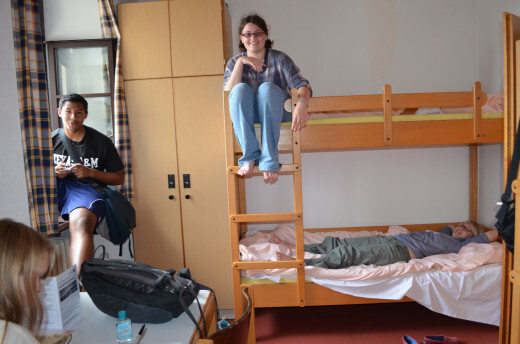 Hostels are all about meeting new people and making great international relationships. Many of my students have made long lasting friends from their hostel experiences, and that’s the best review yet! Are you more willing to try a youth hostel now? That's a good hub about youth hostels. 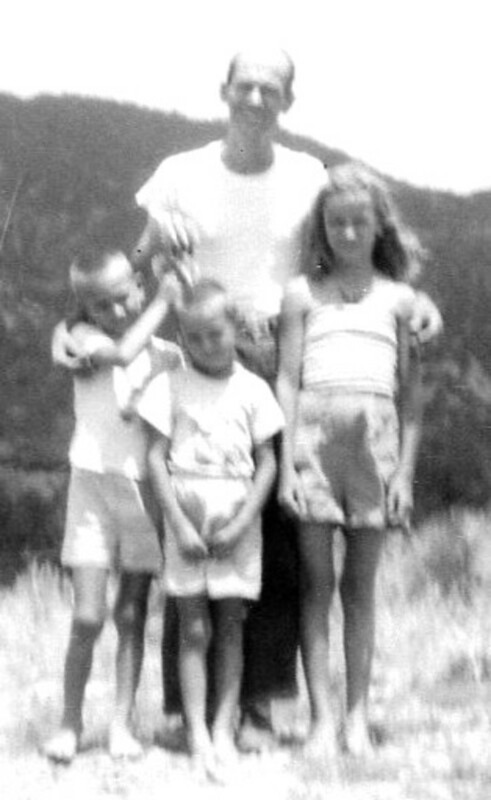 I not only have used them extensively in the past as a young person on my travels but continue to do so with my own children. It's not that we necessarily need to save the pennies but the conviviality and shared experience of hostelling beats the formality and privacy of a hotel any day - and actually we've stayed in some astonishing buildings, from 11th century castles to old mill houses and so on. Great stuff. I love youth hostels, and I absolutely do not believe that you are ever too old to use one. Meeting people of all different walks of life is one of the joys of using them. I like that you included photos. I've always wondered about hostels. I am too old now to use one or even to travel to Europe, but if I was younger, I wouldn't hesitate to use them now that I understand them better. Nice job here with great pix and info. Voted up. About ten years ago I was travelling quite a bit in Europe and stayed in a few hostels. Certainly some were nicer than others. I too came across the coed bathroom situation, which didn't bother me as much as the level of cleanliness in that particular hostel. Our room also had a huge hole in the floor, so we could see into the room below! Oh well, it cost next to nothing :) Nice article. Voted up.